Gardening is a favorite activity for many people in the spring and summer. The gardening season is short in Vermont, so when the weather is good people tend to work until darkness takes over. Paying attention to your body position when shoveling, planting and harvesting is important. Avoid bending from the waist and staying in any prolonged position will allow you to work longer and without pain. 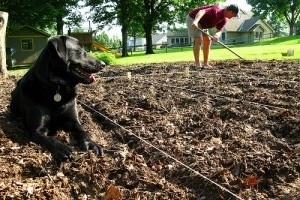 Try to make the flower and vegetable rows wide enough to allow you to sit when planting. This will allow you to change positions frequently. Protect yourself from UV rays by wearing light colored clothing and use sunscreen. Finally make sure that you drink water throughout the day. This is particularly important as the more you sweat, the more you are at risk of dehydration. If you follow these simple tips, the fruits of your labor will not include an aching back!